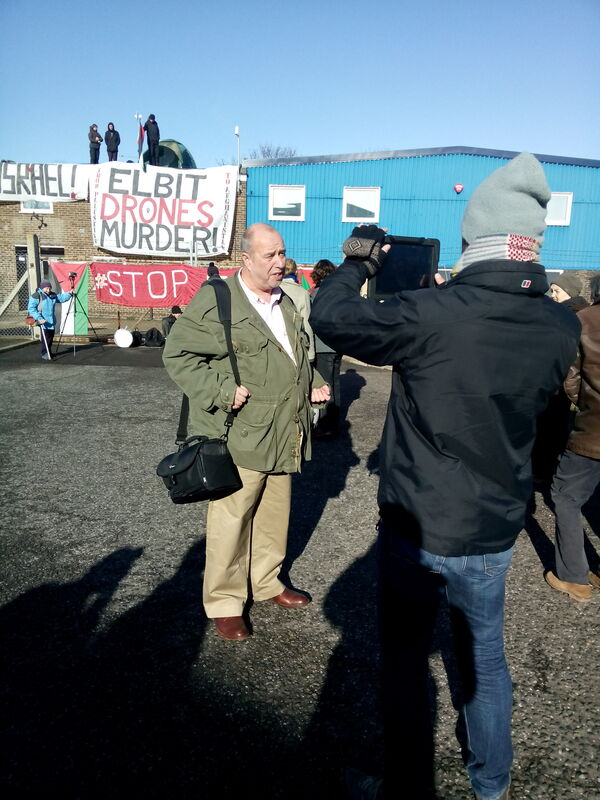 Protesters yesterday occupied and shut down an arms factory in Broadstairs linked to last year’s devastating massacre of Gazans and to the machinery of Israel’s apartheid system. 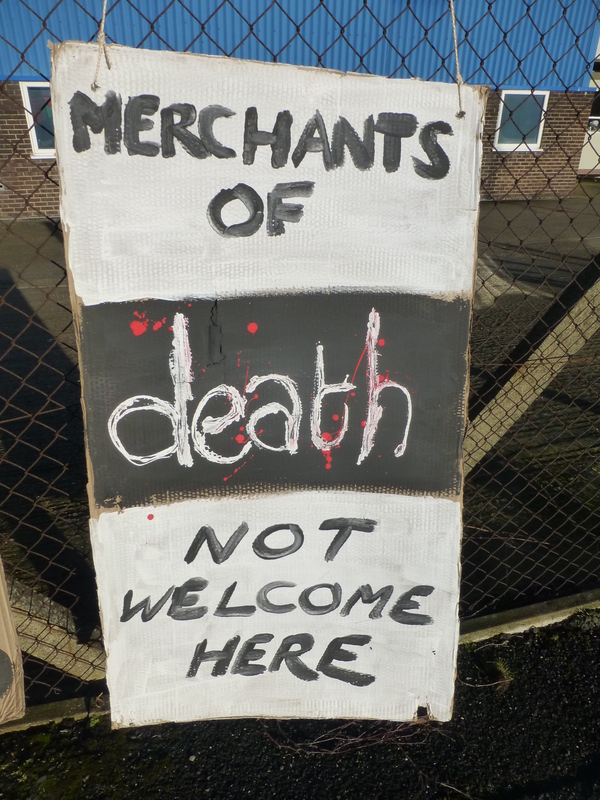 While few local people knew that they were neighbours to a firm making parts for drones, targeting systems and other instruments of death, widespread media coverage of the occupation and protest means many more have been made aware that its monstrous activities are being conducted in our east Kent community. 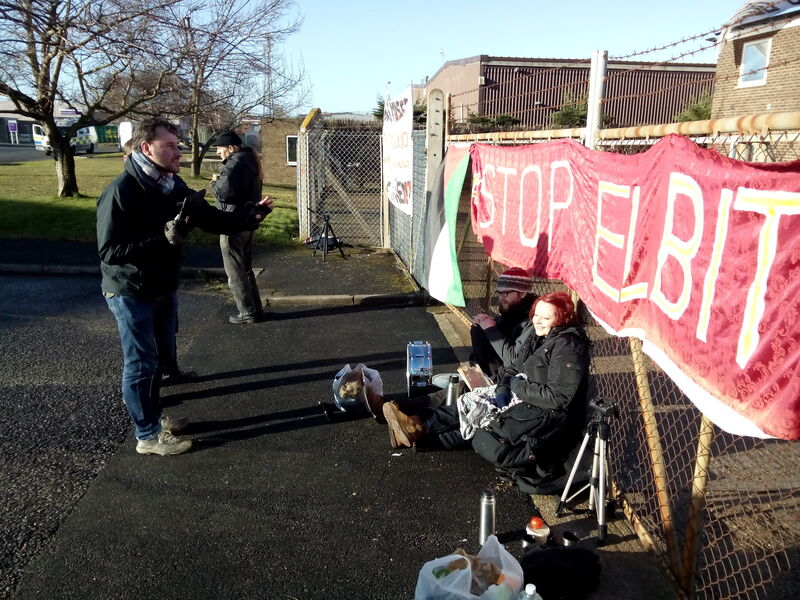 The direct action began at 5am on Tuesday 17 February, when protesters scaled the factory fence. Four climbed to the top of the two-storey building and one woman locked herself by the neck to the fence using a bicycle D-lock. Many more campaigners joined her outside the gate. The group were from Kent, Brighton, London and Wales. Police arrived half an hour later, and appear to have alerted the company, as few employees arrived for work – those who did were turned away, as were delivery trucks bound for the firm. 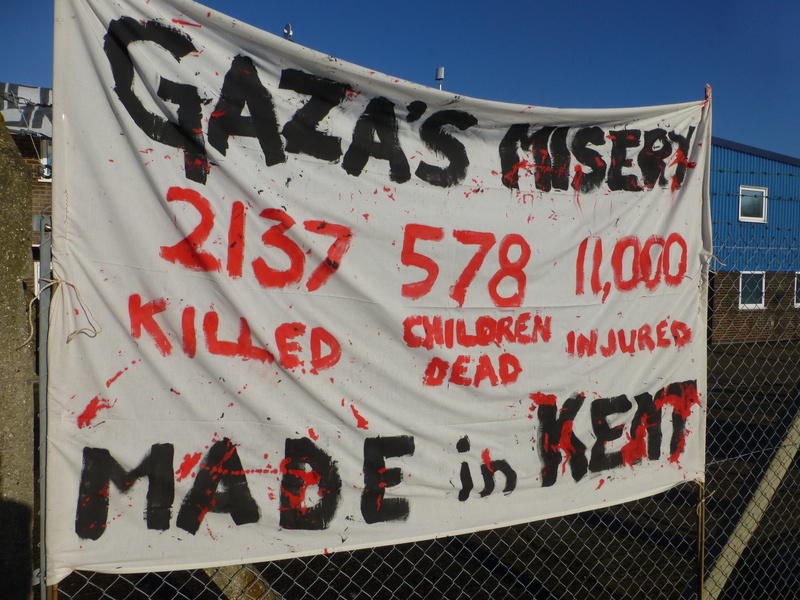 Huge banners were hung from the roof of the building, while others were used to decorate the fence of the company compound, one of which read: “GAZA’S MISERY – MADE IN KENT” and detailing the tallies of dead and injured from last year’s attack on Gaza. Protesters complained that, on arrival, police officers ‘stole’ the group’s food and water supplies, telling them that they could reclaim them ‘from a local police station’. And no thanks at all to @kentpolicethan who spitefully took all our food this morning ! However, a regular trail of supporters and fellow campaigners who arrived throughout the day ensured that the group’s supplies were restocked. 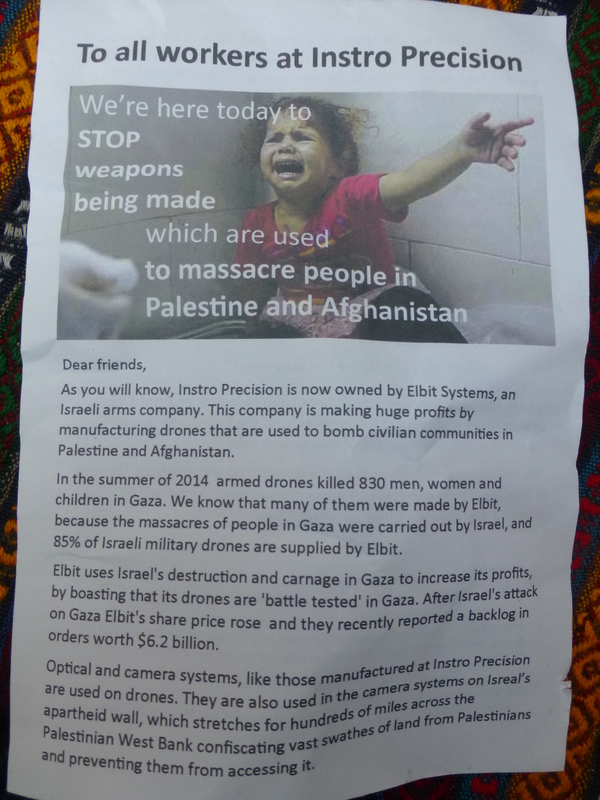 The company, Instro Precision Ltd, is a wholly-owned subsidiary of Elbit Systems, a major Israeli arms manufacturer which supplies 85% of the Israeli occupation army’s drones, as well as technology to maintain Israel’s apartheid system through its system of walls and checkpoints. For more information on Elbit, see its entry on the Corporate Watch website. While few Instro employees turned up, the campaigners had prepared an explanatory letter that they intended to distribute to them. We’re here today to stop weapons being made which are used to massacre people in Palestine and Afghanistan. As you will know, Instro Precision is now owned by Elbit Systems, an Israeli arms company. This company is making huge profits by manufacturing drones that are used to bomb civilian communities in Palestine and Afghanistan. In the summer of 2014 armed drones killed 830 men, women and children in Gaza. We know that many of them were made by Elbit, because the massacres of people in Gaza were carried out by Israel, and 85% of Israeli military drones are supplied by Elbit. Elbit uses Israel’s destruction and carnage in Gaza to increase its profits, by boasting that its drones are ‘battle tested’ in Gaza. After Israel’s attack on Gaza Elbit’s share price rose and they recently reported a backlog in orders worth £6.2 billion. Optical and camera systems, like those manufactured at Instro Precision, are used on drones. They are also used in the camera systems on Israel’s apartheid wall, which stretches for hundreds of miles across the Palestinian West Bank confiscating vast swathes of land from Palestinians and preventing them from accessing it. Two of us visited Gaza, in Palestine, in 2013 and spoke to survivors of earlier drone attacks. They told us that they wanted people around the world to stop companies making the drones that killed their loved ones. They don’t want anyone else to suffer the way they have. “Why should they manufacture these weapons to kill innocent people? They should stop and close those factories. They only do it for the money. They get money and they cost our lives. “If they only thought for a second about what these weapons can do they would stop. What do they feel when they see people killed on TV? If they came over here and lived just one day in this area, and heard the bombing and the drones, what would they feel? Media were alerted to the protest early in the day, with editors waking reporters early in the morning to tell them to cover the story, and the first journalists arrived soon after the police, who responded by retreating some distance away and behaving less aggressively than before. Media were on site for most of the morning, some broadcasting live from the site, and interviewing protesters at the gate and those on the roof. Not one media outlet, including national and international, could persuade Elbit Systems or Instro Precision to provide a quote or respond to the activists’ arguments. The story dominated regional BBC and local newspaper coverage, and was also covered in national and international media. Coverage included the BBC, the Independent, RT, Kent Online, International Business Times, the Electronic Intifada, Press TV (including video), Mondoweiss, the Thanet Gazette, Middle East Monitor, the Morning Star and ITV. Pride of place, though, goes to the excellent video report by local community magazine Thanet Watch. The story was also, of course, widely discussed on Twitter, as you can see via the #StopElbit hashtag – or see this Storify summary. As local people heard about the attack on the radio, some were inspired to travel to the protest site to show their support, thank the protesters and to bring them supplies including food and blankets. 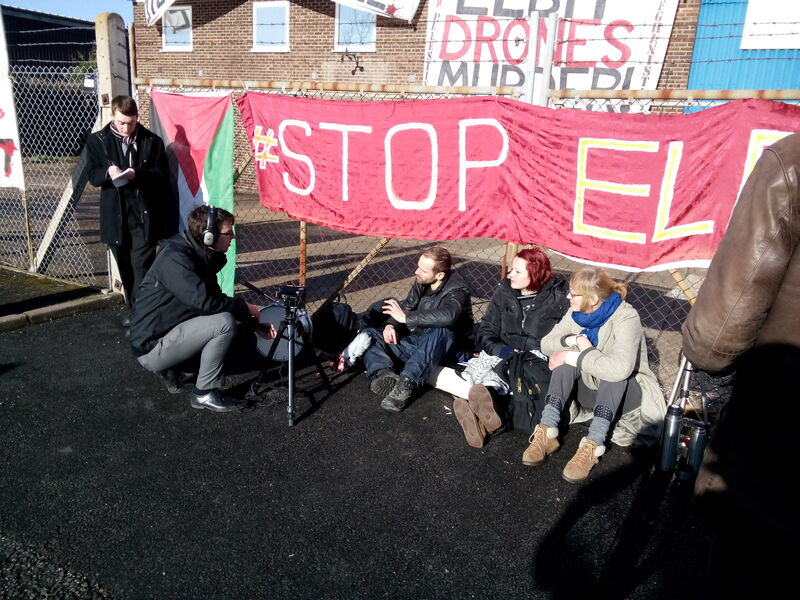 Visitors included Thanet South Green Party parliamentary candidate Ian Driver, who expressed his support for the protesters passionately when interviewed by journalists on site. Meanwhile, other businesses on the light industrial estate – who had been largely unaware of the exact nature of Instro’s activities – also showed their support. One allowed protesters to use its toilet facilities; delivery drivers beeped, called out and raised fists in support as they passed; another business owner brought the activists food. As the daylight was fading, the police sent a helicopter to hover over the site – to what purpose wasn’t clear, although protesters believed it was intended to intimidate. Having garnered local and international coverage, and having stopped any instruments of death from having been made in Broadstairs that day, the protesters decided to leave the site, and managed to do so without any arrests being made. Why they were allowed to leave without further police action, however, remains a mystery. Police told protesters that they had a no-arrests policy in dealing with the occupation of the arms company, and indeed no one was arrested. This raises serious questions about why not, given that potentially those locked to the gate and on the roof could potentially be charged with aggravated trespass. 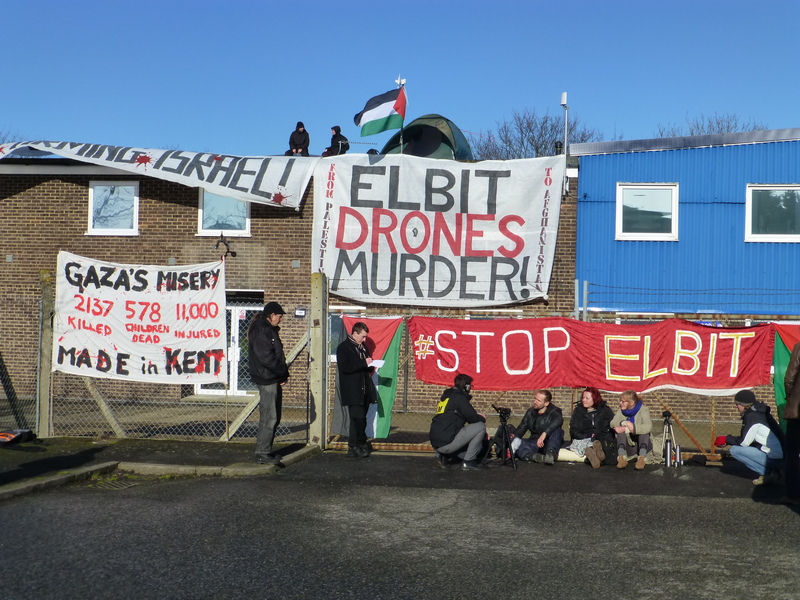 Protesters voiced the possibility that Elbit / Instro had itself requested that the police make no arrests, because this would avoid the company’s business being discussed in public in a court case. 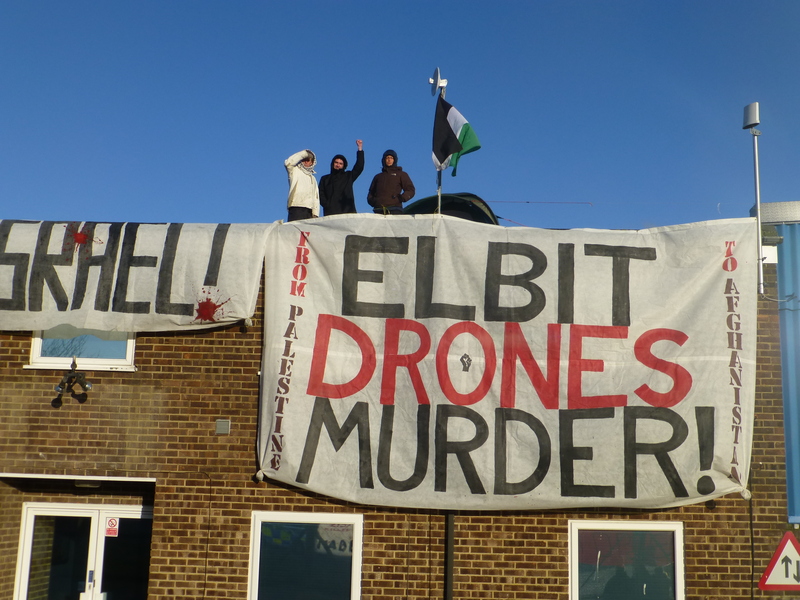 Just a few weeks ago, the prosecution of participants in an earlier occupation of another Elbit subsidiary in Birmingham collapsed after the defendants – who said that by their actions they had been preventing a greater crime – asked for details of the company’s arms export licences to be published. This would have released details of exactly where its products were being sold, and someone – the prosecution, the company or the government – was so unwilling for this to be aired that they preferred to see the protesters walk free. 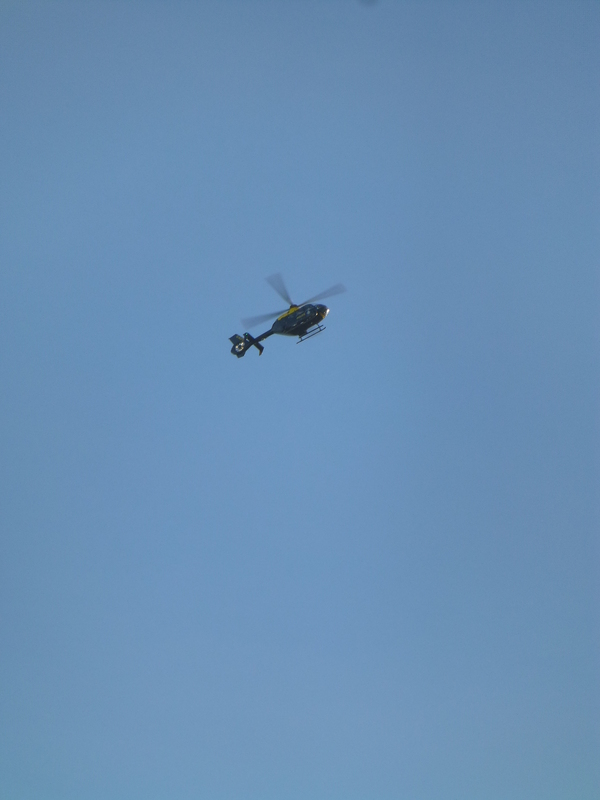 Did Elbit step in in Broadstairs and tell the police not to make arrests that might lead to a public exposure of its activities? For more detail on that case, click here. And does this now mean that activists can now disrupt Elbit activities in the UK, when and where they please, without fear of arrest and prosecution? If so, this week’s events have led to an extraordinary situation – and it seems unlikely that protesters will let the company rest. A final question that the protest raises: Can the three other arms companies based in east Kent rest easy, or will they soon have the glare of publicity turned on them, too? We are one of over forty branches of the Palestine Solidarity Campaign across England and Wales, campaigning for Palestinian self determination, national, human and civil rights.